The neighbourhood of Lapad is a residential part of Dubrovnik situated about 3 km northwest of the Old Town. In this area you will find numerous apartments and guesthouses as well as number of hotels. Starting from Hotel Palace which is located on the solitude are beneath Petka hill, Hotel Uvala, Hotel Komodor, Hotel Vis, Hotel Splendid and Hotel Adriatic. 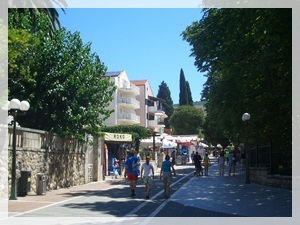 Along Lapad bay promenade you will find numerous hotels. Next to lapad bay beach there is a newly upgraded 4-star Hotel Kompas. Hotel's More beachfront location makes it ideal for relaxed and peaceful summer holiday. In this area you will find numerous restaurants and cafés with outdoor terraces. 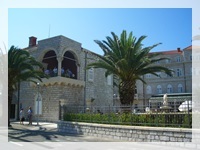 Dubrovnik hospital is located in Medarevo which also belongs to Lapad (city bus no.9 runs from Pile Gate to the hospital). 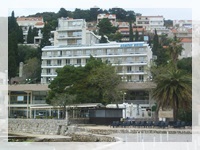 Hotel Dubrovnik Palace is a part of Adriatic Luxury Hotels chain. This hotel has exceptional beachfront location beneath Petka hill. Hotel offers accommodation in 308 modernly equipped rooms and suites offering amazing sea views. Hotel Palace offers great sport facilities: 4 swimming pools, one of each is indoor, beach area with PADI Diving centre, tennis centre as well as fitness centre. Hotel Dubrovnik Palace has an ideal location for meeting and conferences (8 meeting rooms) and wedding as well. Hotel More is a beachfront hotel with 35 luxury rooms and 10 suites. Its ideal location in the peaceful area offers amazing and relaxed holiday. Hotel More has its own concrete beach area with deck chairs and parasols for use of the guests. Hotel has a unique bar, cave bar located beneath the hotel where you can enjoy in refreshments and drinks. Hotel has a private garage. Hotel Uvala is located beneath Petka hill and is surrounded by rich pine forests. 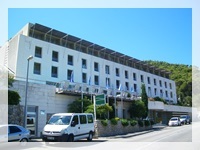 Hotel has 51 air-conditioned rooms and offers relaxed stay only short bus ride from Dubrovnik's Old Town. Hotel Uvala has two-level wellness & spa centre with both indoor and outdoor swimming pool. On the beautiful terrace of Restaurant Mantala you can enjoy diverse offer of meat and fish dishes as well as Croatian wines. 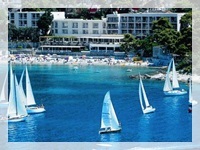 Hotel Adriatic is ideal choice for younger travellers who seeks for beach relaxation on a budget. This basic hotel provides accommodation in 107 air-conditioned rooms most offering sea view. Close to the hotel there is a beach area for relaxing and swimming. 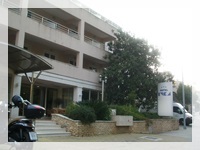 Hotel is located in the near vicinity of Lapad promenade where many nice restaurants and cafés can be found. To reach Old Town you need to take bus No.4 (in front of the hotel). Hotel Komodor is among the oldest hotels in Dubrovnik. This small and cosy hotel offers accommodation in 63 air-conditioned rooms. Hotel is located in area where you will find numerous restaurants, cafes, souvenir shops. Lapad bay beach area with numerous beaches is only short walk from the hotel. The first floor boats a lovely private terrace with swimming pool. Hotel has a restaurant with terrace and a bar where you can have an aperitif. 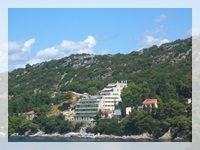 Hotel Vis is located right on the sea in Lapad bay, only 2 km distance from Dubrovnik's Old Town. Hotel has a beautiful pebble beach with snack bar Lido situated right above it. Hotel's restaurant offers local and international meals for breakfast, lunch and dinner. This hotel offers accommodation in 142 air-conditioned rooms (sea-view & park view). Lapad promenade is only a short walk from the hotel. Grand Hotel Park offers accommodation in 244 spacious rooms, 166 in the main building and 78 in Villa Maria and Villa Park. 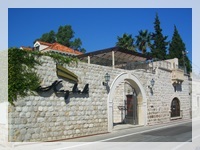 This hotel is situated in Lapad, close to the beautiful promenade with numerous cafes and restaurants. Grand Hotel Park can offer you dining in several restaurants offering national and international dishes. If you would like to treat yourself with visit hotel's Grand Aroma Spa. Hotel has 80 parking spaces exclusively for hotel's guests. 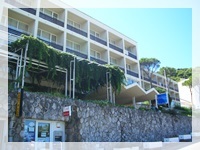 Hotel Kompas Dubrovnik is located just a few steps from the beach and 3 km from the Old Town. Hotel features a seasonal outdoor swimming pool, a fitness centre and a spa & wellness centre. Hotel Kompas offers 173 bedrooms and suites with unique styling details. Guests can choose from classic, superior, deluxe, comfort, premium rooms and executive suites. Hotel Ivka has an ideal location, close to beach area in Lapad, 5 minutes walk to Gruz port and only 10 minutes bus ride to Dubrovnik's Old Town. Hotel Ivka is open throughout the year therefore it is ideal choice for both business travellers and tourists. Hotel offers accommodation in 76 rooms with free Wi-Fi. Restaurant "Konavle" offers a rich buffet breakfast as well as variety of local meals for dinner. Hotel Lapad is located on peaceful location on Lapad peninsula across Gruz harbour. This hotel is set in a beautiful historic building from 16th century. 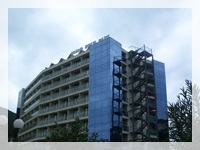 Hotel Lapad offers accommodation in total of 163 rooms and suites which are modernly equipped. In hotel's restaurants guests can enjoy in variety of local and international dishes. Hotel's conference hall Venezia can hold up to 150 participants and is ideal for all kinds of conferences and meetings. Hotel Kazbek is among the most luxurious hotels in Dubrovnik. 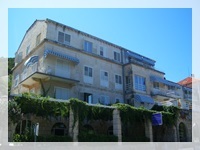 It is situated directly on the coast in the bay of Gruz, just 3 km from Dubrovnik's Old Town. Each of the 12 rooms and 1 suite have been decorated and furnished individually with all comforts guests can expect from a 5-star boutique hotel. Hotel Kazbek features heated outdoor swimming pool with Jacuzzi. Hotel's speedboat (10 persons + crew) is available for private transfers and for excursions to the nearby islands. FROM DUBROVNIK AIRPORT: Take the airport shuttle bus to Pile Gate. From there take one of the following city buses: No.4, No.5 or No.6. FROM OLD TOWN: From Old Town you can take several buses to Lapad. Take city bus no.4 if you need to reach Lapad bay beach or hotels located close to this beach. This bus line runs to Hotel Dubrovnik Palace. City bus no.6 runs via Boninovo, Batala, along Gruz harbour, Lapad bay until it reaches Babin Kuk. City bus no.5 runs from Ploce via Pile Gate, Boninovo, Montovjerna, Lapad bay until it reaches Babin Kuk. FROM GRUZ PORT/MAIN BUS STATION: If you arrive to Dubrovnik by ferry or bus you will arrive to port of main bus station. From there you need to take city bus no.7 which will take you to Lapad area.